Sugar Free for the New Year! If you can’t get enough chocolate, especially Hershey’s chocolate, then you should try their individually wrapped chocolates. Choose from either classic chocolate or special dark chocolate for a delicious, sugar-free treat. Or, add them to your baked goods with their sugar-free semi-sweet chocolate chips. Did you know we have gummy candy that is sugar-free? Choose from either sugar-free gummy bears, fish, or peach rings for a guilt-free gummy candy treat! We also have sugar free gum! You’d be surprised how much sugar is in your favorite piece of gum. Choose from Orbit, Dentyne, Eclipse, or classic Dubble Bubble Gum. 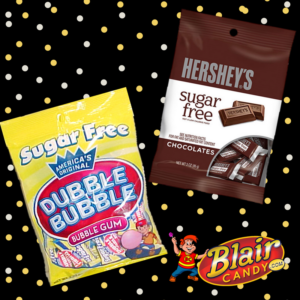 Find these and plenty of other sugar-free candy at BlairCandy.com! Find gummy candy, chocolate, gum, hard candy, and so much more so you can keep up with your healthy resolutions without skipping out on your favorite treats. Candy to Baked Goods: Need something a little extra for your cookie or brownie recipe? 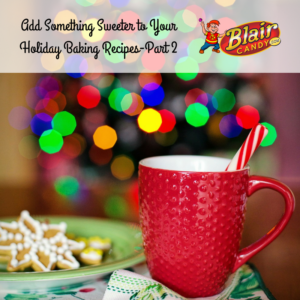 Try adding some M&M’s, chocolate candy, or crushed up candy canes! Bring Holiday Cheer to Work: Share the love with your coworkers and bring the treats to work! A festive candy dish will have your coworkers snacking on candy all month long. Spice Up Your Child’s Lunch: How cool would it be to open your lunch and find a sweet treat inside? Pack a couple pieces of your child’s favorite candy with a note to make their day. Freeze It: Most chocolate candies can last up to 10 months in the freezer. Be sure to store them in either an air-tight container or bag to make sure they stay fresh. You can enjoy your bulk holiday past the holiday season with these helpful tips! For more tips, recipes, and new products, check out our blog every week for the latest candy news. It’s Almost National Candy Cane Day! Legend has it that these treats have been spreading Christmas cheer since 1670! Apparently, a German church patron shaped the candy to look like shepherd hooks and handed them out to children during the church service. Why? To keep them quiet and occupied during the long service! These treats didn’t make it to the United States until the mid 1800’s! They also didn’t add the red stripe until the 1900’s. Overall, over 1.2 billion candy canes make it to shelves in the U.S. during the holiday season every year. The world’s largest candy cane probably won’t fit in your home! The Guinness World Record goes to a Geneva pastry chef who made a candy cane that measured over 51 feet long and made with over 900 pounds of sugar. If these facts have you wanting a candy cane, head over to BlairCandy.com! There you’ll find all of the classic and contemporary candy canes in bulk you need to celebrate National Candy Cane Day. Shop now for a festive, holiday treat or two. If you’re looking for a candy gift for a fan, definitely consider Pez. Whether you’re looking for a single character, or if you want the whole collection, Pez has you covered. Enjoy those classic little candies anywhere you’d like. Check out the single Pez dispensers or grab the whole package of Pez for you or the Star Wars candy fan. Make movie night even more special with these Jelly Belly jelly beans! This package of jelly beans has special flavors along with the classic Jelly Belly flavors you’ve come to know and love. Either enjoy alone or with other themed treats for a delicious movie viewing party. Find these and other Star Wars treats at BlairCandy.com! 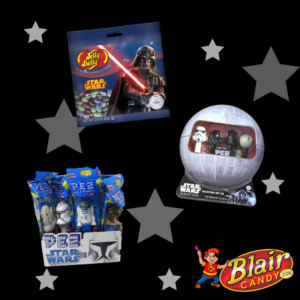 We have all of the candy toys and treats you need for a themed event, party, or just to surprise the super Star Wars fan in your life. How do you eat a box of Nerds? Do you eat them as one flavor at a time? Or do you eat both flavors at once for a delicious combination? Regardless of how you enjoy them, you should definitely try this box of Lime/Pineapple Nerds. If you’re a fan of retro candy, then you have to try the Idaho Spud. Don’t let the name fool you; this sweet candy has chocolate, coconut, and marshmallow for an all American treat. Looking for a sweet snack to take on the go? Then you definitely have to try Pocky. Each box contains biscuit sticks that are coated in chocolate cream. They also make strawberry and matcha green tea flavors to spice up your snack time. For the Hershey Lovers, try the new Gold bar. Sweet caramel cream packed with pretzel and peanut bits makes this bar delicious by itself or broken up into desserts and other treats. Try these and other new candy in bulk finds by visiting us at BlairCandy.com! Could Santa get all of the presents ready without the elves? Of course not! Add Santa’s helpers to your candy buffet or goodie bags for an adorable gummy treat. These red and white elves will put a smile on the faces of children & adults alike. You won’t end up on the naughty list if you snack on these Santa gummies. Each Santa has either a strawberry or apple flavored hat, adding a couple new flavors to the holiday mix. Don’t feel like making gingerbread cookies this year? Grab a bag of gummy gingerbread men! You’ll get the gingerbread flavor that is classic during the holidays without all of the baking. 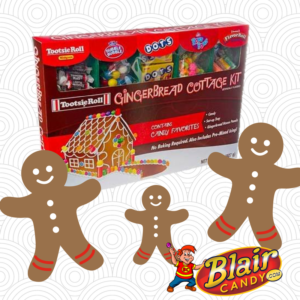 These gingerbread gummies also look great with your gingerbread house kit too! Sour gummies make a great stocking stuffer! For the gummy lover on your holiday list, these sour glitter gummy bells are a real treat. These also look great on holiday cupcakes and cookies for a sparkly touch! 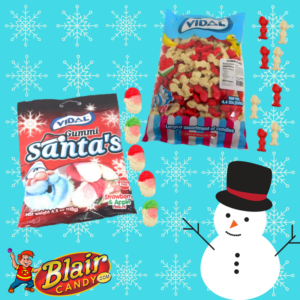 There’s plenty of gummy Christmas candy in bulk on BlairCandy.com! Find these and other delicious holiday candy treats to share with those you love this holiday season. Have You Tried the New Hershey’s Gold Bar? You may see the classic bar shape of this bar and think it’s the classic Hershey’s milk chocolate we all know and love. However, this candy bar has a base of flavorful caramelized cream, giving it a delicious caramel flavor all the way through. If you enjoy salty and sweet flavors, then you’ll love the peanuts and pretzels found throughout this candy bar. The caramelized cream base tones down these two salty snacks. Stock up on these new candy bars with either a 24 or 18 count package for the ultimate sweet and slightly savory treat. We’re not sure how long these bars will stick around, so it’s best to stock up on these wholesale Hershey candy bars! 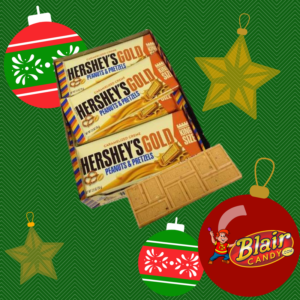 Shop all of our wholesale Hershey candy bars and these new treats today to add a touch of gold to your candy bowl! 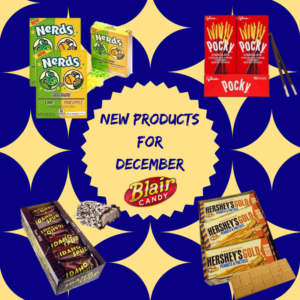 While you’re grabbing a few Hershey Gold Bars, check out all of our new products at BlairCandy.com. Have you tried old fashioned sugar popcorn? This delicious treat is not only great to try, but it also makes great, puffy snow banks to any gingerbread house. Marshmallow Peeps come in all shapes and sizes for the holidays, from trees to snowmen. These make great additions to your gingerbread house or village. There’s always a ton of gummy candy on BlairCandy.com, so there’s no shortage at the holidays. From snowflakes, elves, and Santa Clause gummies, we have everything you need to really add a pop of color to your gingerbread house. 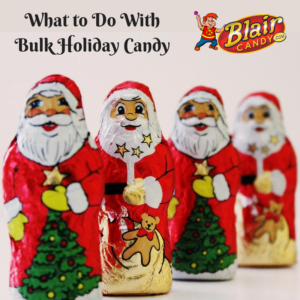 There’s plenty of bulk holiday candy for you to decorate your gingerbread houses at BlairCandy.com! Shop now and stock up on gingerbread kits and more before Christmas arrives. Be sure to tag us on social media with your gingerbread house creations on Facebook, Instagram, or Twitter! Our Holiday Chocolate Cash Cards are ideal for when you want to give a loved one a cash gift along with a little something sweet. That extra touch counts! These cards include 2 solid chocolate coins each, a thoughtful treat to go along with your gift. Another option to include candy in your gifting is to place mini peppermint candy canes with each Christmas card! While each holiday card we receive includes messages of love from our friends and family, we all receive dozens of these cards each year. Make yours stand out with a little extra love inside! You can purchase a 280 count package of mini candy canes that will be sure to last you through your holiday card mailing list! Finally, let’s not forget about our employees or co-workers. Giving the gift of candy at the office can be a great way to show your appreciation. 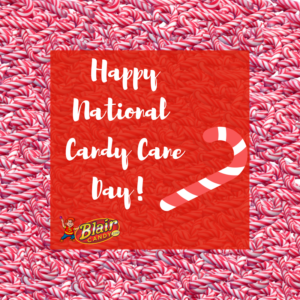 You could gift packaged or boxed candy to individuals on a smaller team or purchase a selection of bulk candy for a larger group. Lindt Lindor truffle boxes provide a sweet retreat from the email inbox for your team members, and with a selection of three different flavors, they can all choose their favorites! Show your thoughtfulness and love with candy during the holidays. It will add a little extra sparkle to everyone’s eyes after they open their cards and gifts to find a confection inside. You will surely be the number-one gift giver this holiday season! Shop all candy in bulk now at BlairCandy.com. Cakes: Another option for adding an extra sweet kick to your holiday desserts is including chopped candies to top off a cake recipe. Any layered cake or batch of cupcakes with candy as decoration will look polished, professional, and holiday party-ready! Chocolate or peanut butter-flavored cakes will pair well with Snickers or Kit Kat chopped candy. Simply sprinkle these chopped candies in the layers of a cake or onto the icing. Presto! You now have a picture-perfect dessert. Magic Bars: Finally, we saved the best for last. Magic bars are those desserts that hold so many sweet flavors, starting with a layer of chocolate on the bottom or a graham cracker crust, followed by a mix of chocolate chips, marshmallow, coconut, nuts, and other candy toppings. We love to toss in favorites like chocolate covered raisins or Reese’s Pieces! Reindeer Food: This can be called a variety of names, Reindeer Food, Reindeer Bait, Reindeer Chow, Puppy Chow…regardless, this treat is absolutely delicious. Mix cereal with sugar, chocolate, sprinkles, and assorted candy for a sweet snack. This also makes a great gift when added to a decorative jar. Ready to get cooking? 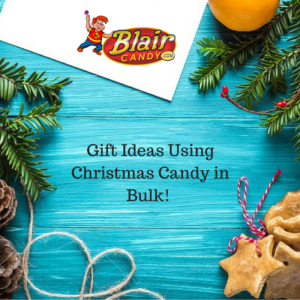 Visit BlairCandy.com today and stock up on all of your favorite Christmas candy in bulk for baking. Also, be sure to tag us on social media and show us the goodies you made this holiday!